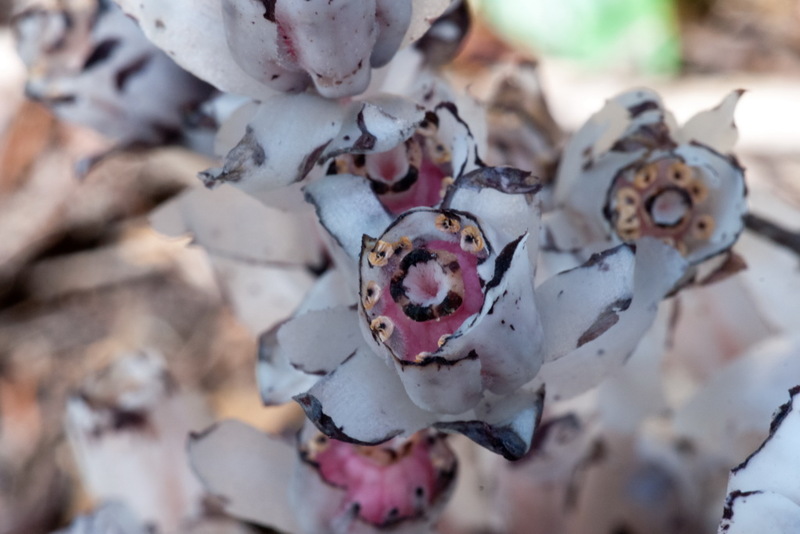 Share the post "Indian Pipe Or Ghost Plant Is Not A Fungus"
Ghost plant is a herbaceous perennial plant native to temperate regions of Udmurtiya in European Russia, Asia, North America and northern South America. It is really a flowering plant and belongs to the blueberry family! Indian Pipe is one of the easiest plants to recognize. It is one of about 3000 species of non-photosynthetic (i.e. heterotrophic) flowering plants. Unlike most plants, it doesn’t have chlorophyll, the stuff that makes plants green. Indian Pipe looks waxy and sometimes complately white but commonly it has black flecks and a pale pink coloration. Rare variants may have a deep red color. 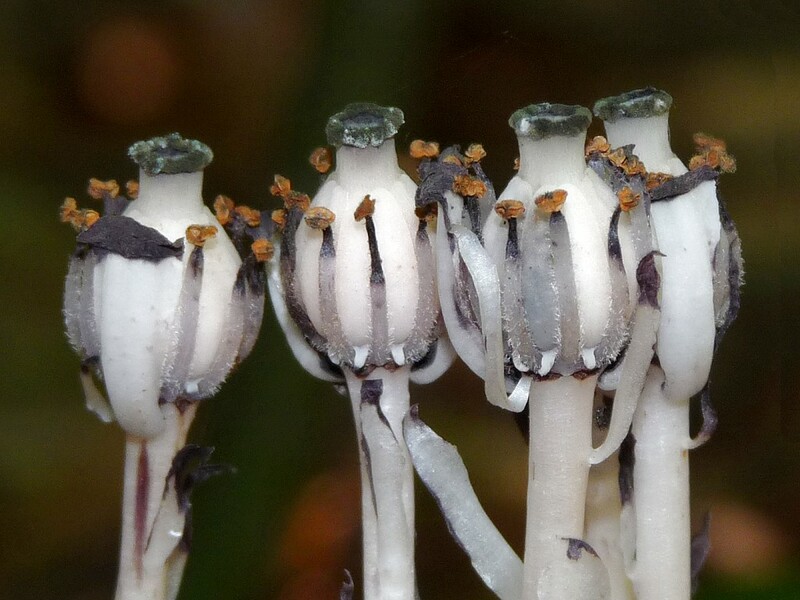 Ghost Plant grows only four to ten inches tall. Only one flower grows on each stem, and some have no fragrance, although they do have nectar which bees collect, so pollinating the plants. They flower for about a week and then die, turning black as they do so, hence the name Corpse Plant. They are very tender and succulent, but when picked will melt away and dissolve. If you pick it then it wilts and turns black very quickly. The flower is shaped like a pipe bowl and so it got its name, the Indian pipe plant, although it is also known as the Dutchman’s pipe. It looks like a calumet, the Native Americans’ pipe of peace. It can actually grow in dark environments because it is not dependent on light for photosynthesis, and often can be found in dense moist forests with with rich soil and much surface leaf litter from June to September. Most people think Indian Pipe is a fungus but it is really a wildflower. Corpse Plant has two special relationships: one with a tree, and one with a fungus. Actually, it’s one relationship, where Indian Pipe takes nutrients from both the tree and the fungus at the same time. 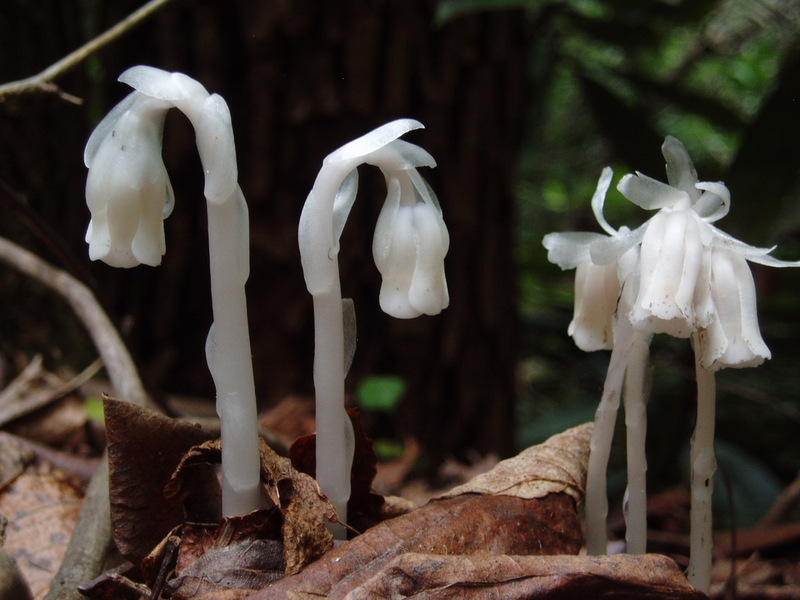 Instead of generating energy from sunlight, Indian Pipe can’t make its own food like most plants, so it is parasitic. It has to “borrow” nutrients from somewhere. The way it does this is by having its roots tap into the mycelia (root-like threads) of a fungus. Meanwhile, the fungus itself has another relationship going on with a tree. The fungus’s mycelia also tap into the tree’s roots. Such a fungi – tree relationship called a “mycorrhizal relationship”. The fungus gives nutrients to the tree and the tree gives nutrients to the fungus. Both organisms help each other out. 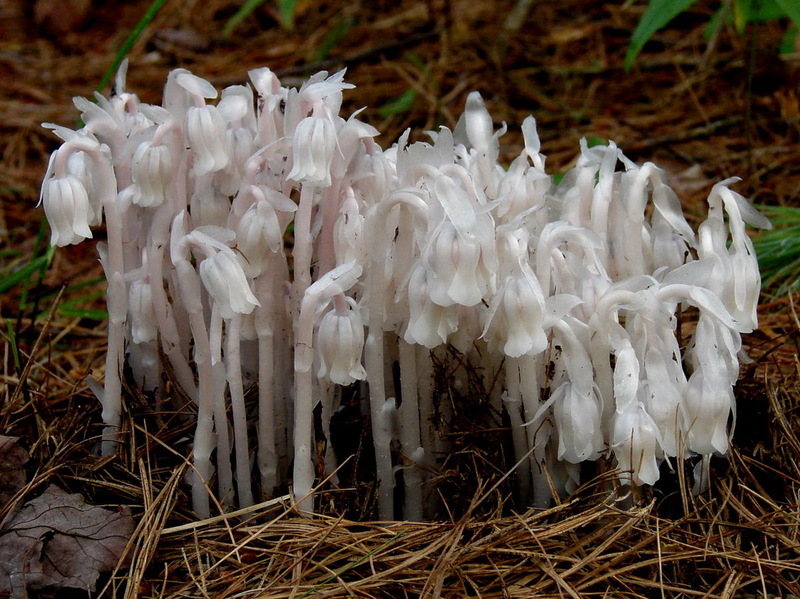 Indian Pipe, however, does not give anything back to the fungus or the tree. It takes nutrients from the fungus, so the fungus then has to take more nutrients from the tree, this makes Indian Pipe a parasite of both the fungus and the tree. Monotropa uniflora doesn’t become a parasite of every fungus and tree, only certain species. For example, they use Russula mushrooms and Lactarius mushrooms. Some trees that have mycorrhizal reltionships with these mushrooms, include American Beech and pines. Monotropa uniflora has been used by the Native Americans for various ailments, as a diaphoretic to promote sweat in fevers, a nerve tonic for restlessness and nervous disorders, as a sedative (it has much the same effect as opium but without the narcotic-induced dreams or hallucinations), and as a way of stopping epileptic fits. It is said that the flowers can be chewed to relieve toothache, and a tisane can be made with the plant to help with colds and flu. You can also crush the plant on corns and bunions to ease inflammation and to eventually get rid of them. The juice of the plant has been used in injections for gonorrhea and is said to be efficacious in treating inflammation and ulceration of the bladder in the form of a douche when mixed with rose water. The plant was soaked in rose water, then a cloth was soaked in the mixture and applied to the eyes. Water extracts are bacteriacidal. Warnings: Safety undetermined; possibly toxic. Contains several glycosides. Safety notes: This website is for educational purposes only. It is not medical advice, and please check with your doctor before using plants if you are pregnant, using medications or have other health conditions.